Galley Wench Tales: Finding Nemo… in Vanuatu! Providing entertainment via "Finding Nemo" from my laptop in Vatulo Yacht Club, Lol Tong, Pentecost, Vanuatu. Pentecost, Vanuatu, island of “land divers,” aka the original bungee jumpers. Stubborn as usual, I was determined to finish up editing the snaps I took of catamaran Field Trip, as they whizzed past us. After all, the Silverstein family was here at Vatulo Yacht Club, as was I, my laptop and a thumb drive to hand off to them before they sailed off Field Tripping again. “Surely those kids are dying to see more than that,” he chided, gently. Ah yes, ‘tis true, and thankfully offset by my husband’s diplomatic prodding. "The kids" were Mary and Mathew’s, who run the friendly Vatulo Yacht Club, adjacent a blessedly sheltered cove between reefs on Pentecost. We were among ten cruisers there getting ready to fill our bellies with a feast of traditional and locally-grown island fare. With more nudging from Wayne, I finally overcame my shyness and paddled ashore, laptop in hand, with “Finding Nemo” all loaded up and ready to roll. Thanks to pirating a "Finding Nemo" copy from “kid boat” Carpe Diem, I finally filled my “Mine. Mine. Mine.” cultural gap and now know finally what seagulls are really saying (google “Finding Nemo seagulls scene” if you have decent wifi – alas I do not!). Besides “Finding Nemo” is great story. My hat’s off to the movie producer’s brilliant and wry rendering of sea life. The day before I’d enjoying watching the clownfish dart among anemones just a stone’s throw away. If I could be that charmed, surely it would be at least as magical to these kids who saw this stuff in their back yard! Mathew and Mary quickly appeared once I dragged my kayak ashore. We decided there was no time like the present to share the film. Admittedly, I felt a little guilty taking and hour and half out of a sunny Saturday afternoon. But, after dodging mosquito bites at dusk the prior night, in an area known for malaria and dengue fever, I preferred the distance of my boat during the hours when these blood-sucking disease carriers were out and about. Mary and a few kids, became a few more, then a few more as Nemo rolled along. My intent all along was to find a way to leave them with a copy, so those who missed it could enjoy it, and those who saw it could enjoy it again. And enjoy it they did! Despite the language barrier (Bislama is spoken here more than English), I knew the visual nature of the story would still come through, aided further by Mary’s translation comments. 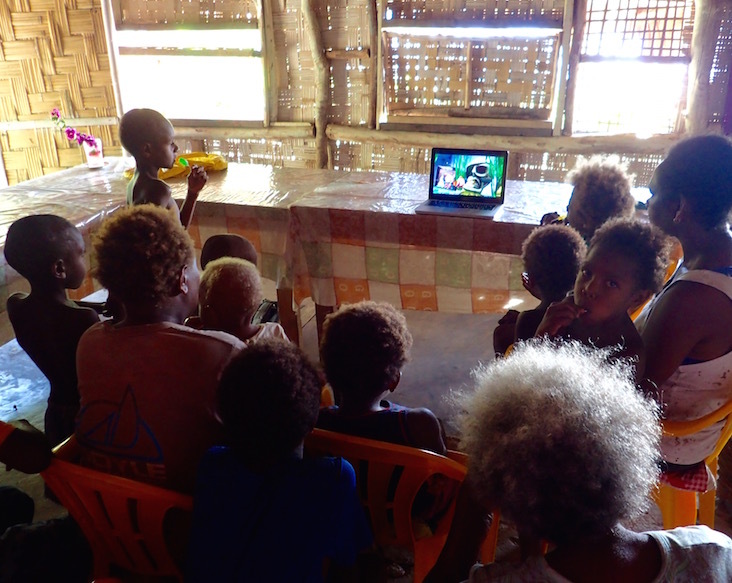 In this Pentecost Vanuatu village, those watching the movie ranged from a nursing baby to a grandma. Smiles all around. Afterward, it took us a while to puzzle through how to get them a copy. My thumb drive was standard USB, their Samsung tablet was micro SD. “Send it over the phone,” Mathew suggested, not realizing there’s no way the wimpy wifi here, which spends a lot of time spinning on simple text emails, could manage a movie download. Ultimately, Wayne came to the rescue; realizing we could do a hard drive to hard drive transfer. It wasn’t compatible from my Mac, but was from Wayne’s Windows PC. So my thumb drive to his laptop to their Samsung and ta-da! They now have Nemo to enjoy at their leisure, and “Matrix” for Mathew. We’d loved to have shared more, but their was only enough space for two movies on their hard drive, and even adding Avatar would’ve been too big. We loved finally feeling like we could make some albeit small contribution to the lovely Vanuatu Ni-Van hospitality. Instead of saying “mine,” we could at last say “yours,” with some grace. Consider giving them a visit, and maybe bring a copy of “Finding Dory” along (we’ve yet to see it ourselves). Do come with an empty bladder though, as there are no available flush toilets and curious locals might wonder why you’re wandering off into the bush. We’re currently anchored off Lol Tong, Pentecost, Vanuatu (S15.32.720 E168.08.848), but about to begin our trek South, to Epi, Efate, and hopefully Tanna before we move on to New Caledonia. 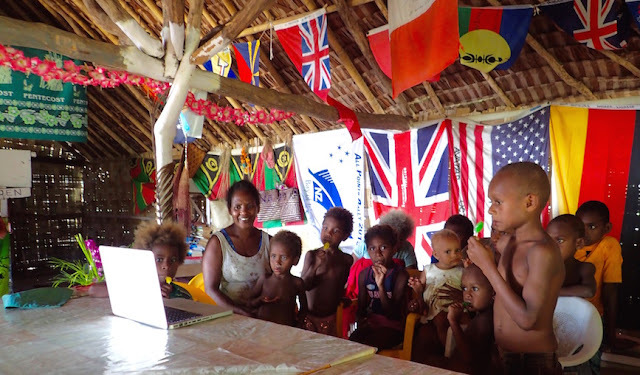 There’s still several catch-up Fiji posts coming, as well as catch-up posts on Vanuatu’s Efate, volcanic Ambrym, and Pentecost. Up Next After Vanuatu, New Caledonia. After New Caledonia, Australia, by December 2016 (but probably earlier). There, we plan to sell our boat, and go back to work, somewhere.